an up-to-date referral from your general practitioner or specialist is required. Medicare refunds can be processed on site as long as you have a valid referral and your Medicare details. Yoga classes for practice patients for osteoporosis, bone health and general well-being with Ms Sheena Brown for osteoporosis: email svcmethealth@stvincents.com.au. 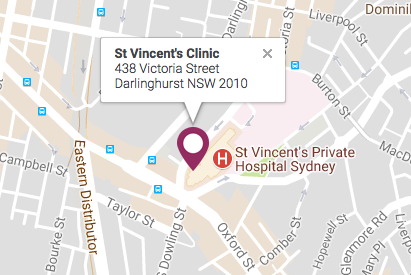 Level 7, Suite 709, 438 Victoria St, Darlinghurst, NSW 2010.